Elementsa,,C Protein powder is a proprietary Ayurvedic blend of Soy, Pea & Whey Protein added with goodness of Amla & Brahmi. Protein has an essential role in supporting bodya(TM)s growth & meeting energy requirements. One serve of Elementsa,,C Protein powder (10g) provides 80% protein. Fortified with BCAAs (Branched Chain Amino Acids) to improve lean body mass & muscle strength. Soy, Pea, Whey protein improves Stamina & Strength. Amla - Supports wholesome Nourishment. Brahmi - Immunity Booster & Supports Cognitive Health. 10g of Elementsa,,C Protein Powder can be taken with 200ml of milk, fruit juice or any other suitable liquids. Stir constantly or shake vigorously to thick shake & consume promptly. Add Elementsa,,C Protein Powder to any food of your choice like gravy, Dal and semi-liquid preparations. 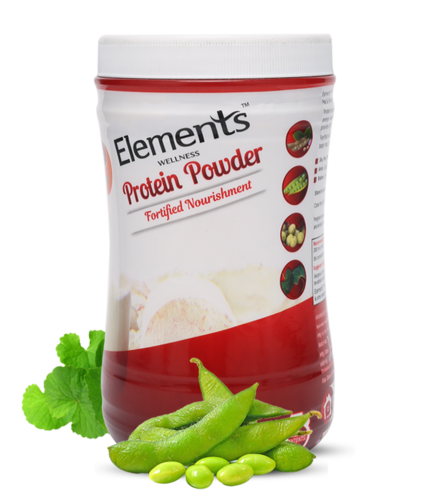 Elementsa,,C Protein Powder can also be added to daily preparations like chapatti, paratha, idly, dosa etc. Elementsa,,C Protein Powder can also be added in preparations of cookies, cakes & other bakery products.